When the River Ouse was being dredged in the early 1960s close by to Lavendon Mill, a number of curious objects were discovered. The objects were tentatively identified as medieval fishing weights associated with basket traps. 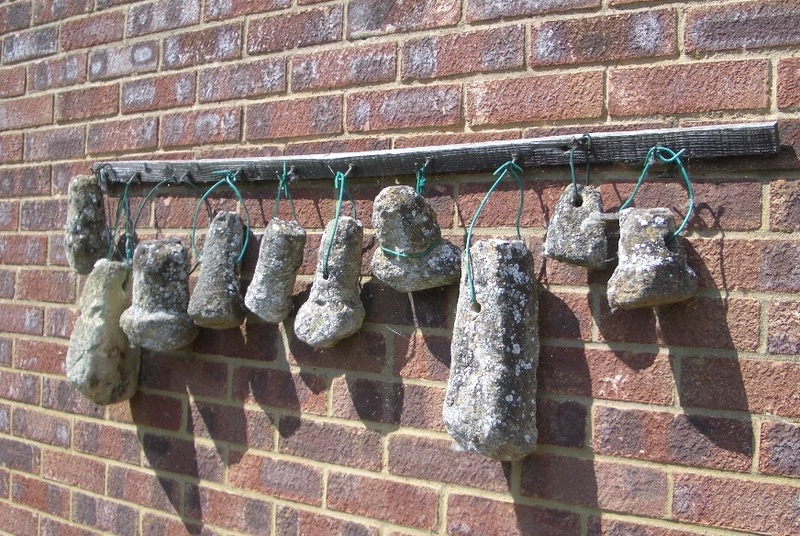 The weights are made of oolitic limestone and have been discovered in a variety of locations on the Ouse and its nearby tributaries. The weights, up to 25cm (10 ins) in length, usually either have a hole through their narrow shaft or grooves around the wider part used to pin or secure the weight into the end of a cylindrical basket. The weight helps to hold the basket down in position. The basket would typically trap small fish or eels which were a common ‘currency’ at mills in medieval times. When the basket was retrieved, the weight would be removed to release the fish or eels. Eels are mentioned as a mill rental at Lavendon in the Domesday Book. Also at Lavendon, in the fourteenth century, a water mill with a free fishery belonged to the Manor of Snelson. Another fishery at Lavendon was the subject of a complaint by the Abbot of Lavendon in 1339 that Simon of Norwich had ‘buried a boat with nets for taking fish in his fishery’. From Records of Bucks, Vol. XXI, 1979. With thanks to the late Mr A Cony and Mrs Cony of Lavendon Mill.